The Rock ‘n’ Roll Half Marathon, 10K and 5K Races come to St. Louis on Saturday, October 17, and Sunday, October 18, and Metro is a good transportation option for runners, walkers and spectators to take part in all of the excitement without worrying about parking, traffic and navigating around several closed streets in midtown, downtown and south St. Louis. 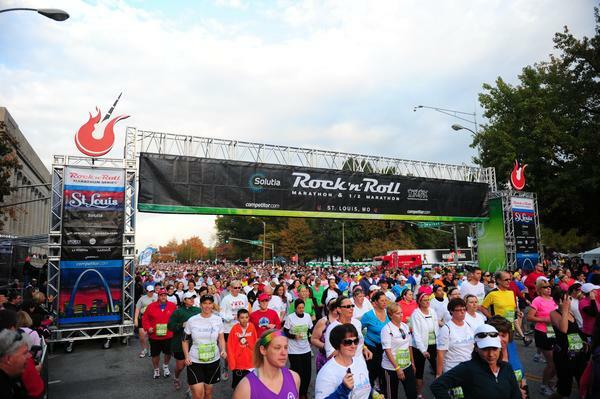 Participants can park at any one of 21 free Metro Park-Ride lots in Missouri or Illinois and take MetroLink to the Civic Center MetroLink Station, which is just a few blocks south of the starting line for all three runs at Market and 13th Streets. Due to scheduled maintenance, MetroLink passengers may experience 10 to 15 minute delays. MetroBus is another option for getting downtown this weekend as several MetroBus routes serve the Civic Center Transit Center, located at the corner of 14th and Spruce Streets, just south of the starting line. Some MetroBus passengers will need to allow extra time for their commutes this weekend because of MetroBus reroutes due to road and street closures because of the races on Saturday and Sunday. Ten MetroBus routes will be rerouted on Saturday, October 17, and 16 MetroBus routes to be rerouted on Sunday, October 18. Several MetroBus routes will experience substantial detours, so MetroBus passengers should visit Rider Alerts before they head out the door. During the reroute, the #4 Natural Bridge will not serve the Civic Center Transit Center, and will instead serve the Convention Center MetroLink Station. During the reroute, the #41 Lee will not serve the Civic Center Transit Center, and will instead serve the Convention Center MetroLink Station. During the reroute, the #70 Grand will not serve the Grand MetroLink Station, and will instead serve the Central West End Transit Center. During the reroute, the #74 Florissant will not serve the Civic Center Transit Center, and will instead serve the Convention Center MetroLink Station. During the reroute, the #94 Page will not serve the Civic Center Transit Center, and will instead serve the Convention Center MetroLink Station. During the reroute, the #97 Delmar will not serve the Civic Center Transit Center, and will instead serve the Convention Center MetroLink Station. The #99 Downtown Trolley will not be in service throughout the duration of the races on Sunday, October 18. In addition, Red Line and Blue Line MetroLink passengers should allow extra time for their trips all weekend because the trains will be delayed 10 to 15 minutes in order to accommodate maintenance work. MetroLink will only operate Red Line trains through downtown St. Louis, and Blue Line MetroLink trains will only operate between the Shrewsbury-Lansdowne I-44 and Forest Park-DeBaliviere MetroLink Stations this weekend. All passengers will need to board MetroLink trains from the westbound platform of the Stadium, 8th & Pine, Convention Center and Laclede’s Landing Stations. Westbound Blue Line passengers will need to board a Red Line train between the Fairview Heights and Central West End MetroLink Stations and travel to the Forest Park-DeBaliviere MetroLink Station to connect with a westbound Blue Line train.